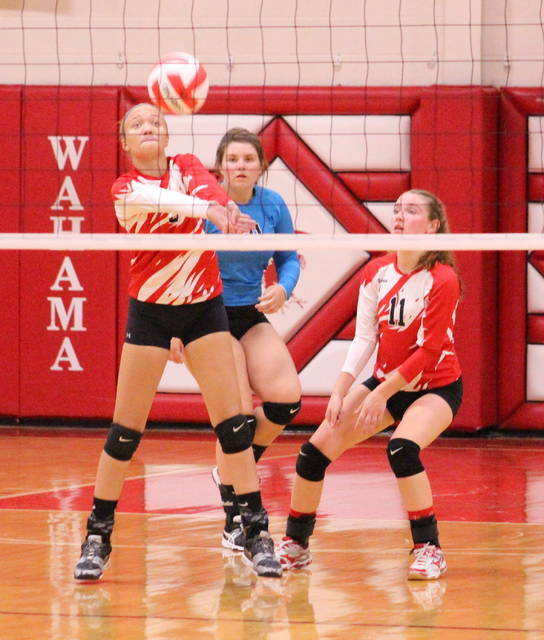 Over two years of frustration came to an end in three short games Monday night as the Wahama volleyball team ended a 30-match losing skid in league following a 25-16, 25-18, 25-15 victory over visiting Belpre in a Tri-Valley Conference Hocking Division contest at Gary Clark Court in Mason County. 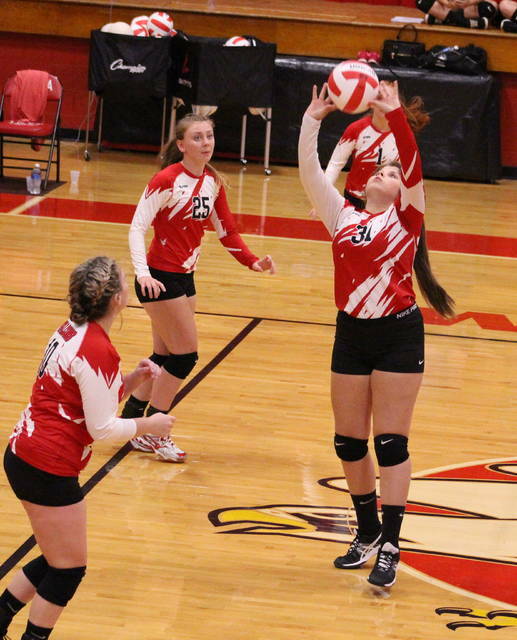 The host Lady Falcons (2-2, 1-2 TVC Hocking) last won a league contest on Sept. 9, 2015, after earning a 19-25, 26-24, 25-19, 25-22 decision over visiting Miller. The Red and White followed by losing their last dozen matches that season, then went 0-16 last fall before starting this campaign with two straight league losses. But, on Monday night, everything finally came together for the Red and White — and the hosts also matched their entire win total from a year ago in the process. There were a total of 10 ties and 13 lead changes in the entire match, but the Lady Golden Eagles (1-7, 0-3) never led by more than four points at any point of the contest. WHS, conversely, led by at least eight points in each of the three games played — including double-digit leads in both the opener and the finale. 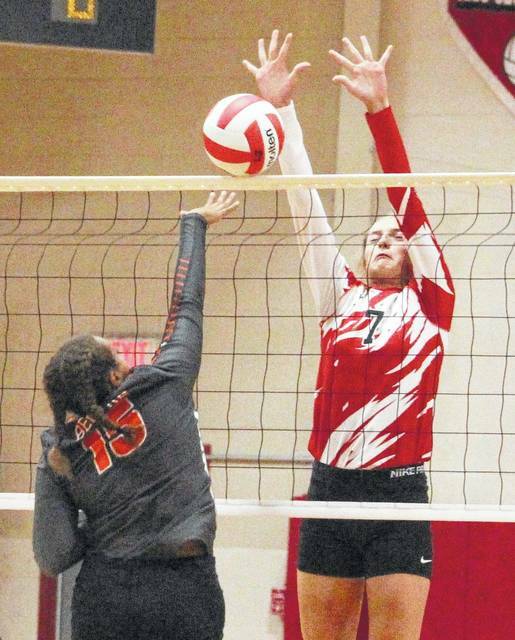 The Lady Falcons collectively recorded 11 kills and three blocks in the triumph and also had four different players record eight-or-more service points in the straight-game outcome. Given the exciting turn of fortunes, WHS coach Matt VanMeter was pleased with how well the evening went for his troops. “Tonight went really well. 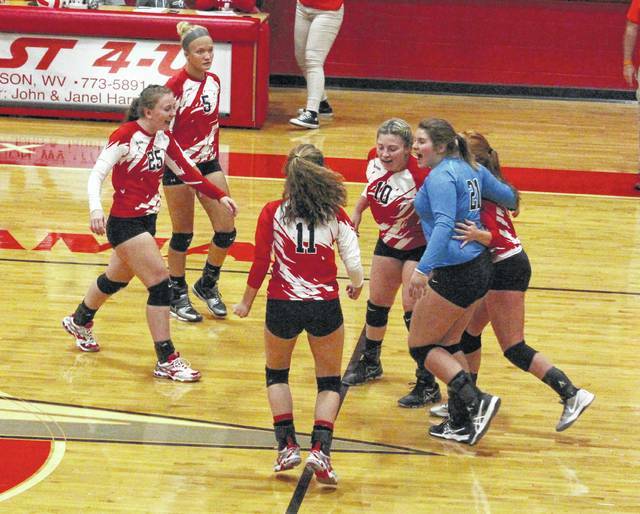 Even when we got down, we never took ourselves out of the game,” VanMeter said. “The girls hung in there when adversity came, which is what you’ve got to do. We had some silly mistakes that cost us some points, but ultimately we were doing the right things when we needed to. BHS took a 1-0 lead in Game 1, but the hosts broke serve and took a 3-1 edge before finding themselves tied again at three. Wahama followed by reeling off 18 of the next 25 points while establishing its largest lead of the night at 21-10 before closing out the opener with a nine-point triumph. The middle game proved to be the real test as there were five ties and six lead changes, and Belpre took its biggest lead midway through at 12-9. After breaking serve, Hannah Billups produced 10 consecutive service points that allowed the hosts to turn a 12-10 deficit into a sizable 20-12 advantage. The Orange and Black countered with six straight points to close back to within 22-18, but the Lady Falcons answered with three straight points to secure the seven-point victory while claiming a 2-0 match advantage. BHS jumped out to a 5-1 lead early in the finale, but the hosts went on a 9-5 run to knot things up at 10 apiece. WHS scored 13 of the next 16 points en route to 23-13 advantage, and the guests never came closer than eight (23-15) before ultimately falling by a 10-point margin. Billups led the hosts with 15 service points, followed by Madison VanMeter and Harley Roush with 10 points apiece. MaKinley Bumgarner was next with eight points, while Gracie VanMeter and Elizabeth Mullins also chipped in three points each. Bumgarner, Gracie VanMeter and Emma Gibbs all led the net attack with three kills apiece, while Billups and Madison VanMeter also had a kill each for the victors. Gibbs also provided all three blocks for the Lady Falcons. Katie Osburn paced Belpre with nine service points, followed by Ryleigh Hannah and Sydney Spencer with five points apiece. Savannah Knotts was next with four points, while Abbey LaFatch also had one point in the setback. Makaylee Deaton led the BHS net attack with four kills. Knotts and Spencer each came away with seven digs for the guests. VanMeter noted that the last two years and two days haven’t been easy, particularly against the fierce competition that the TVC Hocking provides annually. The eighth-year mentor, however, couldn’t help but feel that a huge weight had been lifted from the program’s shoulders. He’s also hoping for a lot more of what he saw on Monday night. Wahama returns to action Tuesday night when it faces Eastern in a TVC Hocking contest at 6 p.m.
Members of the Wahama volleyball team celebrate seconds after winning the program’s first TVC Hocking volleyball contest in over two years on Monday night during a straight-game decision over Belpre in Mason, W.Va.
Wahama freshman Emma Gibbs (7) leaps for a block attempt on a spike from Belpre’s Makaylee Deaton (15) during Game 1 of Monday night’s TVC Hocking volleyball contest in Mason, W.Va.